This is the "extra thick" version with the neck support pre-attached, and no additional support except a 3mm brim at the base. Got nervous a couple times at the bottom, but very happy with the result. 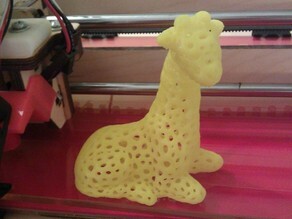 Printed at .3mm in slic3r with a .4 jhead on a Mendel90. Great design and easily printable!